This entry was posted in Pasta on September 8, 2012 by Stacey. Penne pasta from the back of my cupboard, chiffon cut flat leaf parsley from my garden, leftover baked buttermilk chicken breasts (recipe from Everyday Food), homemade stale bread + seasoning breadcrumb crust on the chicken, aging mozza cheese strips, topped with jar tomato sauce with cheeses added. 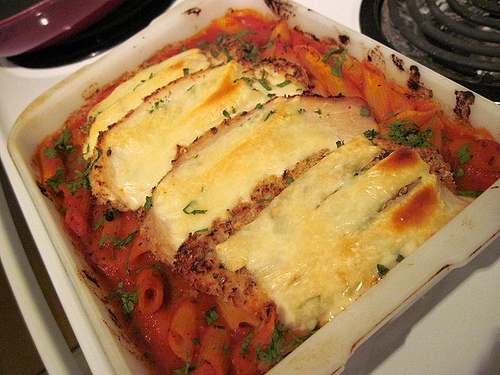 This entry was posted in Links, Pasta, Yummies on July 14, 2011 by Stacey. Tonight’s dinner was crazy. We came home late from work and running a few errands, it was hot outside and then I started to cook over the stove and I started to overheat, and the food was served piping hot and, well… now we’re hiding in the meat locker we call our basement chilling our core body temperatures after eating dinner. Tonight’s dinner was also amazing. I was so busy making the dish, I really didn’t have time to think about how the dish would taste. As a result, I didn’t season any of it. I forgot. Whoops! But, as it happens, I used enough ingredients that all of the seasons I would need minus a few cracks of fresh pepper. I amaze myself sometimes. Ha. 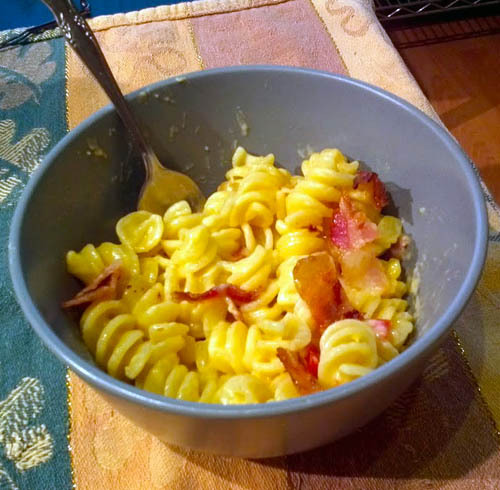 Very basic ingredients were used, starting with the bacon, pasta, onions in butter to start the roux, diced red peppers (to use them up), milk, and grated cheddar cheese. Half the bacon went into the creamy roux sauce when the red peppers did as the milk was thickening, and it was all blended with the cheese in a bowl off the heat before serving. That’s it! No magic involved, but it tasted like there was. The main thrust of this dish is the bechemel sauce with cheddar cheese added at the very end over pasta. That’s it. Very simple, but very tasty when all is said and done. Note: Let’s talk salt! I don’t use much in the way of seasoning for this dish. I let all of the salt that is already present in the cheese, butter and pasta do all the work while leaving freshly cracked pepper to those who want to add it at the table. I also use fresh herbs to give this dish a bit of al fresco. It’s lovely. Try it. 1. 2C rotini or any other similar shaped pasta like penne, etc. cooked in very salted boiling water. 2. 3 strips of bacon, cut into manageable chunks. Chop coarsely after it cooks and cools off into two piles. 3. Cook down 1/2C of diced white onions in 2 tbsps salted butter in a saucepan about five minutes. Add to that 2 tbsp of flour and stir in well till the butter and onions clump up and the colour starts to turn brown somewhat. At that point, add one pile of bacon bits and 1/2 of diced red or green peppers (or both) along with 1 1/2C of milk. Continue to stir so the milk doesn’t get scalded. 4. Scoop the pasta out of the water when about 1 minute away from the al dente stage and place in a bowl on top of cutting board or drain out the pasta water and leave the rotini in the same pot but off the stove (use the cutting board). 5.Grate your cheese over a flexible material that will aid in moving it from the counter to the bowl. I use wax paper. Works like a charm. 6. As the milk thickens from the flour roux, and it coats the back of your spoon or spatula, pour it into the bowl over top of the waiting pasta noodles. 7. Dump the cheese in over the pasta and bechemel sauce, and stir hard till the cheddar is fully melted and the pasta is fully coated in a lovely amber cheese sauce colour. 8. Plate your pasta into serving dishes and top with the second pile of bacon bits and some freshly washed and chopped herb of your choice. I love fresh basil or cilantro over my pasta, but go nuts. DH loves to add a few cracks of pepper over his pasta as well. The beauty of this dish is its versatility. Also its quick ease in which it came be made after a hectic day. This entry was posted in Pasta on July 8, 2011 by Stacey. First batch of the year. Made with leftover sweet potato cubes, white onion, diced tomato, chicken stock, olive oil, S&P and homemade pasta. Made my rice cooker at work. Very tasty. 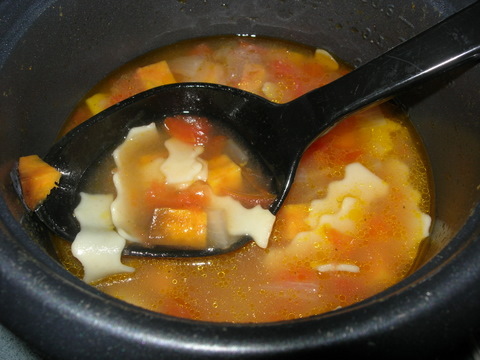 Cook pasta in pot with chicken stock. Remove pasta after it’s almost al dente, leaving the water in the pot to be the base of the brado (broth). Add vegetables and cook at a rolling boil till all are soft and tender then drop the temperature down and add the almost cooked pasta and seasoning. Let this cook gently for 10 minutes on the warm setting to heat the pasta through and to give it time to finish cooking to al dente. This entry was posted in Pasta on October 27, 2010 by Stacey.